This weekend marks the 20th anniversary of the StarCraft franchise. A lot of folks have a lot of love for this series, and few more than the crew that have gathered in what appears to be a Blizzard backlot studio to host a celebration stream. A couch of StarCraft personalities Sean “Day9" Plott, Nick “Tasteless” Plott, Daniel “Artosis” Stemkoski, and Geoff “iNcontroL” Robinson led the yesterday’s festivities, while the same crew sans Sean is hosting the stream today. Names from throughout the series’ decades have shown up to play showmatches, including HuK, WhiteRa, Idra, and Ret. The big finale yesterday was the three-on-three showmatch, which not only put TLO and Idra on the same team—reviving the “unholy alliance” of older StarCraft days—but threw six massive armies onto the same map. If you’ve played an over-the-top custom game in StarCraft before, you already know what happens. You can catch the full replay on the StarCraft Twitch archives, but honestly, the full six hours is very worth your time if you’re an older StarCraft head like me. Between StarCraft II and StarCraft: Remastered, there’s plenty of great show matches with names you’ll probably recognize if you’ve followed two decades of competitive play. Just seeing a lot of these players again is a trip down memory lane. Idra and Huk at the same event spurs up the infamous hallucination army GG, while old rivalries and drama get stirred up again years later. At one point, the two former teammates argue over a plate of stolen porkchops. The commentators get in on the fun too, commenting on Idra’s noticeably improved health and vitality after leaving the pro scene. Part of the fun is the scaled-down production. There isn’t a bunch of lights, pre-produced video segments, b-roll of each competitor’s hometown and past tournament wins. It kind of just bounces back and forth, between the game and the couch, with the occasional player chat. It’s a nice set—nicer today than yesterday—but it’s much more subdued than your average esports event. I’m not saying every tournament should be like this, but variety is the spice of life, and this is a variety you don’t get as often nowadays. It’s a LAN party atmosphere, with joking in all-chat and commentators cracking each other up with cheesy jokes. The history between the players and personalities at the event makes it feel like casual chatter rather than official interviews or professional commentary. Can Tastosis cast the hell out of a StarCraft match? You bet. But they also spend a lot of time imitating the voices of infested Terrans about to pop in a puff of confetti. It isn’t just jokes either. 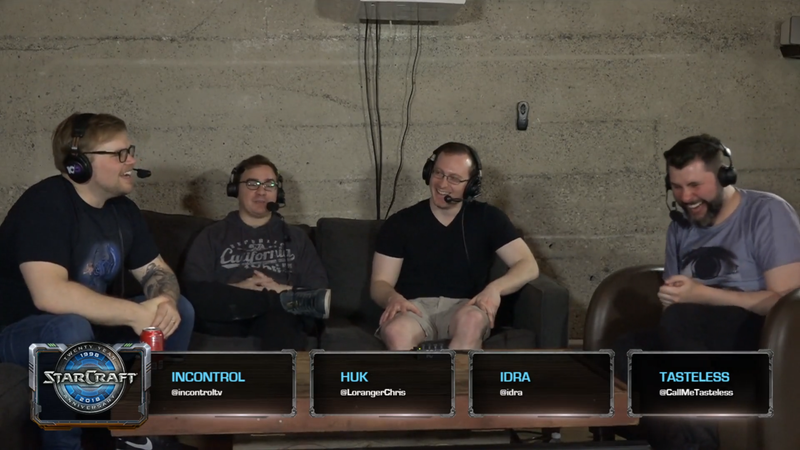 During today’s games, the casters sat down with Idra during a one-on-one match to chat about how the scene has developed. Conversation went from Brood War replays to a very StarCraft issue, ladder anxiety. As much as I love a good GSL match or big BlizzCon stage, it’s heartwarming to walk down old avenues in a toned-down, intimate setting. It’s like seeing your favorite band in a small venue. There are more extravagant ways to celebrate two decades of competitive StarCraft, but I can think of few I’d rather watch over a stream like this one. Catch the rest of the stream over at the StarCraft Twitch channel.